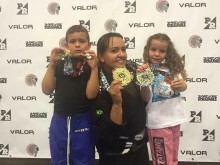 Many people will have spent the Easter weekend relaxing with family, eating chocolate or enjoying spring walks, but at a gym in Bristol a group of grapplers spent 24 hours on the mats doing Brazilian Jiu Jitsu in the name of charity. 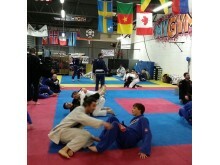 Artemis BJJ, a member club of the UKBJJA (UK Brazilian Jiu Jitsu Association), hosted a GrappleThon. The idea behind these events is simple: at least two people are grappling at any one point over a predetermined period, in this case for 24 hours from 14:00 on March 26 to 14:00 on March 27. 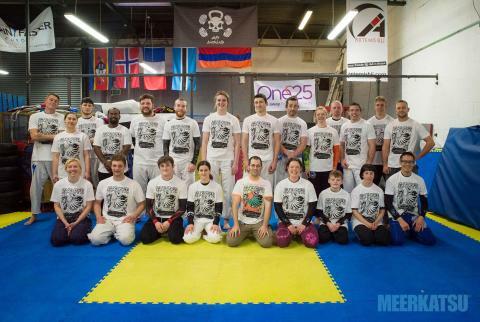 Now in its fifth year, the Bristol GrappleThon was raising funds for local charity One25, which supports vulnerable women, helping them to break free and build new lives away from violence, poverty and addiction. Men, women and children gave up their time and money over the bank holiday weekend to help One25 continue their important work: the current total raised stands at an impressive £3000, with funds still to be counted. Events kicked off at 14:00 with participants coming from across the UK to grapple the night away. By 3am with the late night play list on the sound system, there was one determined pair on the mat who ensured the GrappleThon continued while most people in the country were asleep. 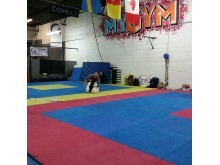 One of the staunchest supporters of the GrappleThon is Seymour Yang, a BJJ black belt who trains in North London. He is also an artist who owns his own BJJ design and clothing company, Meerkatsu. 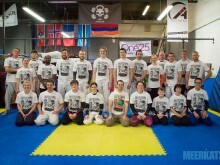 Not only did he design the t-shirts for the event, but he also grappled for a total of ten hours, despite a broken toe. The event was also sponsored by Tatami Fightwear, GIMONO, Bristol Sports Centre and Idee Pure soap. 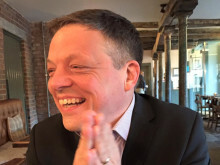 As proceedings drew to a close on Sunday afternoon, the CEO of One25 thanked all those involved and reminded them of the value of their efforts for the local community. Artemis BJJ head instructor and GrappleThon organiser Can Sӧnmez said: ”This year we picked One25 on the suggestion of a student at Artemis BJJ. I had been aware of the charity due to their strong presence at feminist events in Bristol, but I was really impressed by the huge amount of goodwill in evidence every time I mentioned them to anybody local." 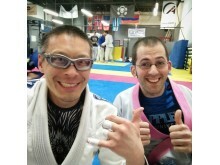 Can continues "In the ten years I've been in BJJ, I've increasingly realised just how amazing it is as a community, rather than simply a sport, hobby or martial art. I'm keen to push that aspect of BJJ, giving back through charitable work as well as providing an opportunity to expand the camaraderie that I've found to be such a notable aspect of BJJ. The GrappleThon is intended to raise lots of money for good causes, but I'm also hoping that it can bring academies and people together. It's been wonderful to see local BJJ schools in Bristol all working towards the same goal, as well as clubs joining in from around the country. 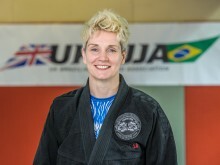 The excellent people at West Coast BJJ in Aberystwyth stand out: for the third year running they sent along a massive contingent of grapplers (led by Katja Birkett) and raised a significant chunk of the total." 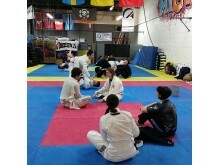 The GrappleThon was also run in conjunction with the UKBJJA’s latest major outreach project Unstoppable Girl which aims to get more women in the UK trying BJJ. 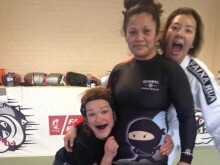 There were plenty of female participants on the mat, experienced grapplers as well as some new faces. 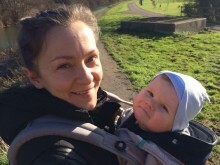 One woman popped down to have a look and expressed an interest in training in the future, along with a female kettlebell instructor at the gym who had tried BJJ before, but was tempted back by the GrappleThon. The GrappleThon will be back next year. 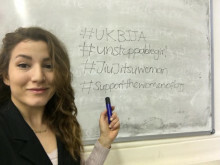 If you want to keep up with their work, the work of the UKBJJA, and its Unstoppable Girl campaign, follow the links on this page.